The people of Ladakh, Jammu and Kashmir, are grappling with the menace of locusts, the migratory grasshoppers. Experts suspect that the pests, Locusta migratoria, have migrated from neighbouring China along the banks of the river Indus due to climatic changes. Ladakh's Changpa nomads say they first noticed the locusts crossing the Chinese border at Demchog around two years back. Since then the valley has been experiencing locust infestations. But this year, the problem has worsened due to bad weather across the border. Experts say heavy rain in China provided an ideal environment for the reproduction of locusts, which subsequently migrated to warmer areas in Ladakh. The worst-affected areas are Changthang and its adjoining Zanskar valley in Kargil. Swarms of locusts have already ruined 80 per cent crops and 70 per cent pasturelands in the region, according to the state agriculture and animal husbandry department.Following the onslaught, a team of entomologists is carrying out surveys in Changthang and preparing prevention and control strategies against the pest. Under the initial phase of operation, the district administration is spraying the pesticide chloropyriphos. However, villagers of Demchog, Skakjung, Koyul and Rongo, who all are Buddhists, have denied using the spray to kill the pests due to their religious sentiments. Meanwhile, environmentalists are worried over the excessive use of pesticides in the plateau, a rare habitat of migratory and endangered birds. It will affect the avian population and break the natural cycle of preventing locusts, they say. 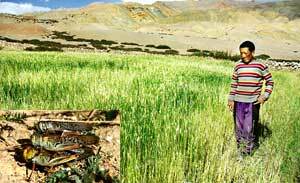 Changthang's fields are now filled with insecticide-laden carcasses of locusts, and birds are feeding on them. While the residents are complaining of bird deaths in the area, experts fear that locusts might further spread to warmer regions of the country such as Himachal Pradesh and Jammu.